Say protein, and all you see in your mind is the image of a muscle. Which is what it is all about. Protein helps build muscle health. But are you taking enough of it? And what are the best high protein foods you need to take to get enough of it? That is what we’ll discuss here. Keep reading. Simply put, protein is a macronutrient required for building muscle mass. Chemically, protein is composed of amino acids. When protein is broken down in the body, it fuels the muscle mass and contributes to metabolism. It also enhances immunity. Which is why it is important. Alright. But which foods are good sources of protein? That is where we are heading to right now. Here is a list of top 48 protein rich foods organised by food group eaten around the world. Here we mention some of the best protein rich foods that you should put on your grocery list! Let us quickly look at the top dairy products high in protein. Two spoons of peanut butter, and you are set for the day with 8 grams of protein. The traditional toast can be flavored with this all-time favorite. You can also add peanut butter to protein shakes or smoothies. Either way, it’s a tasty vegetarian option to consume plenty of proteins. Consumption of peanut butter was also found to reduce the risk of type 2 diabetes (1). You can as well add peanuts to your diet too, as one ounce of them contains 7 grams of protein (along with 159 calories). Swiss cheese also contains other nutrients that can benefit your bones, eyes, and the immune system. Also, it is low in potassium – and hence, kidney patients can enjoy this cheese. Another form of cheese, goat cheese, contains 7 grams of protein for an ounce. You can simply add a slice of Swiss cheese to your bowl of soup or a sandwich. Each half cup of cottage cheese contains 13 gm of proteins. It is a great, inexpensive, and healthy food item. In addition to providing protein for muscles, cottage cheese contains calcium for good bones. You can combine it with vegetables or fruit to make a great dish. Other forms of cheese also have good amounts of protein. It is best taken in its low-fat version. Also, cottage cheese is as satiating as eggs – and could be a good option for weight loss (1). Additionally, Parmesan cheese (1 tablespoon – 4% of daily value) , cheddar (1 slice – 14% of daily value), and mozzarella (6 slices – 75% of daily value) are also rich in protein. You can relish cottage cheese in so many ways. Add it to your toast. Or to your fruit or vegetable salad. You can even enjoy it on its own. Eggs are an excellent source of protein, particularly egg whites. Egg whites are low in cholesterol and high in protein. Egg whites are also low in fat, which makes them the perfect food for a healthy and nutritious breakfast. One cup of egg whites contains 26 grams of protein. This will also provide you with energy and essential amino acids. Adults are advised to eat one egg daily. And as per studies, egg white protein supplementation can increase resistance muscle strength – especially in females (2). You can make egg whites a part of your salad. Tofu is a great alternative to meat and is used in a variety of Indian dishes. Apart from proteins, tofu is also rich in magnesium, iron, and other essential nutrients. Like other soy foods, tofu reduces heart diseases by lowering bad cholesterol and promoting good cholesterol. The best thing about tofu is it takes on the flavor of the foods you cook it with. So, you can replace beef or chicken with tofu in a stir-fry. Apart from protein, Greek yogurt also contains calcium and vitamin B12. Talking about calcium, your body cannot produce the mineral on its own. Hence, you need to take it externally. Calcium is great for the bones. And vitamin B12 is required for the formation of red blood cells and brain functioning. According to ongoing studies, Greek yogurt could also have a favorable effect on the gut bacteria (3). Simply have Greek yogurt at the end of your meal. Soy milk is another great option for vegetarians to get a good dose of proteins. Adding this super drink to your diet will provide you with the recommended daily allowance of protein needed by an individual. Studies also show that the intake of soy milk can reduce the risk of osteoporosis (4). Even 1 cup of whole milk has 8 grams of protein, and comes with 149 calories. Add soy milk to your breakfast cereal. These best protein sources pack a major protein punch. Steak is especially rich in amino acids. These acids help prevent numerous muscle-wasting diseases. Simply put, they protect and build your muscles. 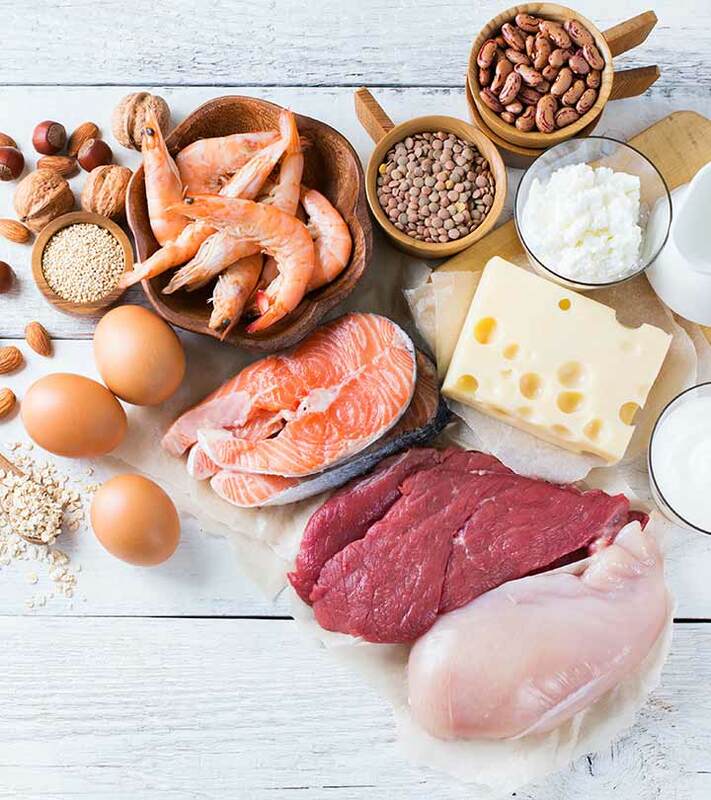 Amino acids can also reduce blood pressure and strengthen the connective tissues (5). A serving of ground beef (85 grams) contains about 23 grams of protein, which is 45% of the daily value. While a 3 oz serving of roast beef contains 18 grams of the nutrient, 1 oz serving of beef jerky (lean beef meat trimmed of fat and cut into strips) contains 13 grams of protein. Simply include cut steak pieces in your salad. You can also go for beef stock soup. Pork chops are excellent sources of zinc as well. This mineral is essential for performing numerous reactions in your body. And the deficiency of zinc can lead to night blindness and a weakened immune system. Canadian bacon, another form of pork, contains 15 grams of protein for every 3 oz serving. And chorizo, a spicy Spanish pork sausage, has 21 grams of protein for every 3 oz serving. While pepperoni contains 18 grams of the nutrient for the same amount of serving, a slow-roasted pork loin contains 28 grams of protein for every 3 oz serving. You can serve pork chops with salad or cooked vegetables. You can also braise them with mushroom sauce and eat with brown rice. Apart from being one of the best high protein foods, turkey breast can also make you feel full for long periods. The breast of turkey has less fat and calories than most other cuts of meat. And it contains selenium, which can help prevent a range of cancers. Keep in mind to avoid processed turkey. You can opt for fresh, lean, organic turkey. And just like that of chicken, you can include turkey breast in your evening meal. Intake of poultry has numerous benefits for people of all age groups and conditions. It is especially beneficial for individuals who have a higher protein and calorie need (6). While using chicken breast, instead of tossing the bones away, you can use them to prepare bone broth. This is another food that is rich in protein (¼ cup contains 20 grams of the nutrient). Or you might as well gone for canned chicken too. A 3 oz serving contains 21 grams of protein. You can divide your plate evenly between whole grains, fruit, vegetables, and chicken breast – for your evening meal. Below is a list of high in protein foods that falls under seafood category. Oily fish like halibut are rich in omega-3 fatty acids, which are known to reduce the risk of heart disease and lower cholesterol levels. Halibut is also low in saturated fat, the unhealthy kind of fat. Enjoy the fish baked or grilled and not fried. You can go for low-salt and low-fat seasonings like lemon, herbs, and spices. The omega-3 fatty acids in sardines reduce the risk of inflammation and cardiovascular disease. Other important nutrients sardines are rich in are selenium (to prevent oxidative damage to the body) and vitamin B12 (for nerve function and brain health). Sardines also have vitamin D that facilitates bone health. Simply add chopped sardines to your salad. The upside about cod, apart from being a superb source of protein, is that it contains very less fat. And more of the heart-healthy mono and polyunsaturated fats. The vitamins D and B12 regulate bone health and improve nerve functioning respectively. Cook cod right on top of fresh green beans along with a flavorful sauce for a delicious treat. In addition to protein, anchovies are also rich in magnesium, calcium, and phosphorus – all of which are imperative to bone development and maintenance. Calcium also supports cardiovascular functioning. It stimulates the blood vessels in the heart, while magnesium makes them relax. The two, in unison, maintain heart health and blood pressure. Anchovies are usually purchased in cans – and though canned anchovies are not nutritionally deficient, they contain excess sodium that can be harmful. Hence, choose fresh anchovies. You can add sautéed and grilled anchovies to pasta and tomato sauce. Like all seafood, the octopus is lean and low in calories. One downside is cholesterol – it is high in it. So, practice moderation. Otherwise, it is naturally rich in iron – the mineral required for the transport of oxygen to different parts of the body. Iron also plays a major role in cell growth. And the selenium in octopus acts like an antioxidant and prevents damage by free radicals. Another nutrient it contains is vitamin B12 that supports brain function. Even shrimp contains decent amount of protein, with a 3 ounce serving having 18 grams of protein (and 84 calories). Ensure you thoroughly clean the octopus before cooking it. You can then sauté octopus chunks and simmer them in seafood stock. You can also add onions and bay leaves to the pan and season with salt and pepper. Drizzling the dish with lemon juice before serving adds an extra punch. The tuna is also rich in B vitamin that aids nerve functioning and blood circulation. This food is a low-calorie and low-cholesterol protein source. One serving of light tuna (154 grams) contains about 39 grams of protein. It makes up for 79% of the daily value. Using your skillet, you can prepare grilled fish. It will taste delicious. Salmon is a powerhouse of nutrition. It greatly contributes to the overall health. The omega-3s reduce inflammation and help treat joint pains. They also aid neurological repair and heart health. And also, salmon can promote skin health. According to a report by the Washington State Department of Health, salmon fish can help treat abnormal heart rhythms and strokes (7). You can also take wild-caught salmon (and other wild fish) as it also is rich in protein. The protein content is similar to that of Alaskan salmon. Or even take take sockeye salmon – where a 3 oz serving contains 23 grams of protein. Add smoked salmon to your pasta along with cream. Apart from being one of the protein rich foods, tilapia also contains omega-3 fatty acids (whose benefits we have seen). It is a good source of calcium as well, which, apart from building strong teeth and bones, also works with potassium to enhance nervous system function. You can cook tilapia with anything. It is very low in carbohydrates. Simply add it to your salad or slather it with your favorite sauce. Check out here the best sources of protein in seeds and nuts category, that you will surely want to add into your diet. Two spoons of peanut butter, and you are set for the day with 8 grams of protein. The traditional toast can be flavored with this all-time favorite. You can also add peanut butter to protein shakes or smoothies. Either way, it’s a tasty vegetarian option to consume plenty of proteins. Consumption of peanut butter was also found to reduce the risk of type 2 diabetes (8). Did you know that most fruits taste delicious with peanut butter? Yes – add a helping of peanut butter to the bowl of fruit that you have every evening. And if you don’t have a bowl of fruit every evening, start doing so. It’s healthy. Pistachios are good sources of fiber, which promotes digestive health. Fiber can also encourage satiety – consequently preventing overeating and aiding weight loss. Pistachios are also high in folate that is good for pregnant women. They are nutrient-dense and possess antioxidant compounds that are wonderful for health (9). Add pistachios as toppings to your yogurt or salad. Simple. The seeds contain plant compounds quercetin and kaempferol, which possess anti-inflammatory and anticancer properties. Boil raw quinoa seeds with a dash of salt and have them as an evening snack. Almonds are known to reduce cancer risk and heart disease. They also help lower cholesterol levels. Also, the nuts are known to cut diabetes risk (10). Almonds can be added to salads and other dishes for extra flavor. You can add them to your favorite smoothie as well. Regular intake of walnuts can help prevent gallstones. They are also a good source of copper that improves bone mineral density and prevents osteoporosis. And walnuts also contain magnesium that can help combat epilepsy. Walnuts also contain polyphenolic compounds that reduce the inflammatory load on the brain cells and enhance interneuronal signaling (11). Top your salads or yogurt with walnuts. The seeds are also rich in zinc that enhances immunity. This very zinc even improves prostate health and prevents prostate cancer in men. Pumpkin seeds can also improve insulin regulation, thereby preventing diabetes. Other seeds rich in protein include flaxseeds (1 cup – 61% of daily value) and sunflower seeds (1 cup – 58% of daily value). You can eat the seeds on their own. Or you can use them as a topping for your salad. Pecans contain healthy fats that contribute to weight maintenance. They are rich in antioxidants, which makes them an ideal food to beat oxidative stress. Pecans also stimulate hair growth, reduce stroke risk, and improve digestive health (12). You can simply have roasted pecans as an evening snack. Hemp is the next best product for those allergic to soy-based offerings. This plant derivative provides you with many essential amino acids that the body uses to build muscle. Hemp dairy products and hemp seeds contain fatty acids that greatly improve the immune system. You can have a handful of the shelled seeds, toasted or as they are, as a nutritious evening snack. The copper and iron in cashews aid the formation of red blood cells. 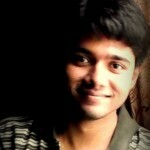 This, in turn, keeps the entire system functioning optimally. Cashews are also exceptionally good for your eyes. They are an excellent source of magnesium, a mineral that is required for body processes (13). Intake of cashews has also been linked to cancer prevention and weight maintenance. You can add a handful of cashews to your evening smoothie and enjoy the tasteful delight. They are rich in fiber and omega-3s and offer a host of benefits (14). The seeds also offer a superb energy boost. They deliver a massive amount of nutrients with few calories. Chia seeds also improve certain blood markers, which can cut the risk of heart disease and type 2 diabetes. Adding chia seeds to your smoothie is one of the best ways to consume them. Here are top foods rich in protein in the grains and legumes section. Often hailed as the most protective bean, soybean has the highest protein content amongst all plant sources. It is also the only plant food containing all the essential amino acids. It contains omega-3 fatty acids that prevent cardiovascular disease and some forms of cancer. And the fiber in the bean promotes digestive health. Soybean is also rich in iron and calcium that are required for optimum health. Another food is natto, a popular Japanese breakfast option that is nothing but fermented soybeans. ½ a cup of natto contains 15 grams of protein. Edamame, yet another Japanese soybean dish (salted green soybeans boiled in their pods), contains 8 grams of protein for every ½ cup serving. And tempeh, an Indonesian dish prepared by deep-frying fermented soybeans, contains 16 grams of protein for every ½ cup serving. One simple way is to go for soymilk, which you can easily find on supermarket shelves. You can even add soy cream to your morning tea or coffee. Or best, you can simply replace in your bread or muffin recipes with soy yogurt. Given they are rich in folic acid, fiber, and potassium – lentils are great for heart health. The folic acid is also critical during pregnancy – it was found to cut the chances of early delivery by as much as 50%, and it also reduces the risk of birth defects in newborns. Lentils also fight fatigue as they are rich in iron. Even Ezekiel bread can be a good option. This is often considered the healthiest form of bread one can eat. It contains several types of grains (like wheat, barley, and millet) and legumes (like lentils and soybeans). 1 slice of Ezekiel bread contains 4 grams of protein and has 80 calories. You can add lentils to any kind of soup for added fiber and nutrients. The beans are rich in vitamin B1 that improves memory. The vitamin can also prevent Alzheimer’s. Kidney beans also contain molybdenum that detoxifies the body. Even black beans, navy beans, and other kinds of beans are rich in protein – 1 cup of them contains 15 grams of the nutrient. And by the way, bean chips, the favorite snack for many, contain protein too – 4 grams of protein for every oz serving. You can combine the beans with your soups or salads. Wheat germ is also rich in vitamin E, an antioxidant that fights free radicals. Other nutrients it is rich in include zinc, magnesium, potassium, and thiamin. A dose of wheat germ in your yogurt or smoothie can do the trick. In addition to protein, oats are also good sources of soluble fiber – which can help prevent coronary heart disease (15). They also improve digestion and prevent colorectal cancer. You can thicken your smoothie with a spoonful of oats. Or better, mix oats, yogurt, grated apple, and a pinch of cinnamon – leave them overnight in the fridge, and the next morning, you can have a super powerful breakfast. Being rich in fiber, barley aids digestion and weight loss and helps control blood sugar and cholesterol. It also offers protection against cancer. You can simply consume whole grain bread that contains barley. Or cook it to make hot cereal. Barley can also be added to stuffings and enjoyed. Chickpeas are a form of complex carbohydrate that the body slowly digests for energy. This helps control blood sugar levels. Being rich in protein and fiber, chickpeas increase satiety. This discourages overeating and, in turn, aids weight loss. The high fiber also improves digestion and prevents any digestive ailments. Another chickpea dish, called falafel, contains about 3 grams of protein per serving. And ½ a cup of hummus, made from ground chickpea and sesame seeds, along with olive oil, garlic, and lemon, contains 6 grams of protein. You can add chickpeas to your salad. Soba noodles are also a great source of manganese that improves glucose metabolism and the nervous system. It even accelerates wound healing. It is also rich in thiamin, the deficiency of which can cause muscle weakness and confusion. You can make your own soba noodles and add a few veggies like spinach, mushrooms, and carrots for that extra punch of nutrition. Green peas are rich in numerous other nutrients, including iron, copper, zinc, calcium, manganese, and vitamin K – all of which promote numerous bodily functions. They also prevent brain damage that can otherwise cause Alzheimer’s disease. The fiber in peas contributes to gastrointestinal health (16). Simply add raw peas to your salad. Brussels sprouts come packed with vitamins, minerals, fiber, and proteins. These sprouts also contain some essential organic compounds that have potent anticancer properties. You can slice the sprouts thin and mix them raw with salad greens. Below is a list of foods with the highest protein rich fruits and vegetables. One of the best high protein vegetables, Broccoli has been touted as one of the best foods to fight cancer. Given it is replete with phytochemicals, it works as a great anticancer food (17). And the vegetable is also a great source of fiber, especially soluble fiber (which helps regulate blood glucose and cholesterol and prevents diabetes and heart disease). Broccoli is also an excellent source of vitamin K that enhances bone health (as vitamin K improves calcium absorption). You can simply add half a cup of broccoli to your daily meal. You can also consume raw broccoli salads. Another good thing about asparagus is it can prevent urinary tract infections. The amino acid asparagine this veggie contains makes it a natural diuretic. It also contains vitamin E that boosts and improves skin health. And yes, it works as a natural aphrodisiac – thanks to folate and vitamin B6, this vegetable can boost feelings of arousal. An advantage with asparagus is you may not have to season it – it has a distinct flavor. One easy way to use this vegetable is steaming it or using it raw in a yogurt dip. An upside is that sweet corn is pretty low in fat. And that’s good news. The vegetable is also rich in potassium and vitamin A. Potassium is usually lost through sweat, and hence, regularly replenishing the mineral is important – as it contributes to heart health and bone strength. Vitamin A works as an antioxidant. The vegetable is rich in fiber as well – the benefits of which we already know. Sweet corn can make an awesome addition to soups. You can also add it to your salads and casseroles. Another important nutrient cauliflower is rich in is choline. This nutrient enhances memory and learning, improves sleep, and helps with muscle movement. Choline also aids in the transfer of nerve impulses and assists in fat absorption. The vitamin K in the vegetable promotes stronger bones. Cauliflower also has a high fiber and water content, which prevents constipation and reduces the risk of colon cancer. A unique way to include cauliflowers in your diet is by mashing them, just like potatoes. And then add garlic and cheese to the dish – you won’t leave it. You can also add cauliflower to a vegetable salad (along with a serving of mushrooms, which contains 4 grams of protein). Apart from potassium and fiber, apricots are also rich in non-heme iron (the type of iron found in plants). A diet rich in iron can prevent anemia. Also, non-heme iron is not as easily absorbed as heme iron. Which is why you should take apricots along with a source of vitamin C (vitamin C enhances iron absorption). Diced apricots could be a great addition to your evening salad. Tangerines are loaded with flavonoids, compounds that contain anticancer properties. These neutralize the free radicals that cause diseases and can prevent heart disease. Flavonoids might also improve blood flow in the coronary arteries. The folate in tangerines maintains the health of new body cells. Also, the potassium in the fruit helps fight osteoporosis. You can consume tangerines as a healthy evening snack. Or slice them and add to a salad and relish. Both coconut water and coconut pulp are highly nutritious. Coconut water offers an array of health benefits and is highly recommended, especially during the summer season. Raw coconut is also rich in medium-chain triglycerides – which can aid weight loss. A single serving of coconut meat offers several minerals, and including it in your diet invariably increases its nutritional value. And several substances in coconut can help boost your immunity. Do not throw away the shell after drinking the water as the soft pulp of the tender coconut is equally rich in proteins. The pulp tastes extremely delicious. You can either have it raw or add it to salads. Coconut milk is also rich in proteins and healthy fats. Bananas are also very good sources of potassium. They relax the walls of the blood vessels and lower blood pressure. The fruit can also be a good food to be taken during diarrhea – as electrolytes like potassium are lost during diarrhea, and banana helps replenish the mineral. Bananas, being rich in fiber, can prevent heart disease and diabetes. They are also rich in amino acids and can be used as face packs to treat dry skin. Your morning breakfast smoothie can be rich in protein too – as every 1 cup serving contains 16 grams of the nutrient. You can add chopped bananas to your breakfast porridge. Smoothies or milkshakes of the fruit are equally delicious and healthful. The fruit is rich in folate, which is an essential nutrient during pregnancy. It reduces the risk of miscarriages and ensures a healthy delivery. Avocados also prevent the build-up of homocysteine, a substance that can contribute to depression by impairing circulation and the delivery of nutrients to the brain. Avocado consumption also improves heart health (18). You can replace butter with avocado on your morning toast. Or, if you are having chicken or egg salad, you can use this fruit in the place of mayonnaise. Being rich in fiber, guavas enhance digestive health and prevent related disorders. They are rich in vitamin C as well that boosts immunity and skin health. You can eat the fruit or prepare its juice. Or add the fruit to a salad and enjoy. Other fruits like pomegranates, grapefruit, and passion fruit contain about 2 to 5 grams of protein per cup. We saw the natural sources of protein – food items rich in protein that are readily available in your kitchen. But, given how our farming practices are deteriorating, eating just one fruit or vegetable doesn’t help you meet the required daily protein needs. You need to have multiple of them. Which may not be possible always. Yes – that’s where we are heading. There are two proteins found in milk. One of them is casein. And the other is whey. When you add a coagulant to whey, the curds and whey separate. The resultant whey protein is the water-soluble part of milk, and it is widely considered to be the best protein source. Whey is often used as a protein supplement, especially to hit targeted daily protein goals. This form of protein is absorbed faster than other forms, and it increases muscle protein synthesis. Whey also offers a large amount of L-cysteine, an amino acid whose deficiency usually occurs during the aging process and diabetes. Even as the amount of protein in whey protein can vary between brands, on an average they offer about 20 to 50 grams of protein per serving. Though whey doesn’t harm the liver or kidneys, it can aggravate the damage if the organs already have an issue. Hence, people with liver or kidney ailments must refrain from taking whey protein supplements. Also, consult your doctor. You often feel anxious and moody. Protein contains amino acids that are the building blocks for neurotransmitters (they control your mood). Your workouts are not great. Protein is required to sustain your energy during workouts. You are unable to sleep well. Protein helps in the production of serotonin, low levels of which can cause sleep issues. You have high cholesterol despite following a proper diet. Cholesterol levels also rise due to hormonal imbalances and increased inflammation, which can be treated with adequate protein intake. You experience a lack of focus and concentration. Inadequate protein means inadequate amino acids, and that means decreased neurotransmitters (which help improve your concentration levels). You get injured often and are slow to heal. As we know, protein is a body building food. Its deficiency can slow down the healing process. You feel fatigued often. Metabolic functions also depend on amino acid intake. If you have any of these symptoms, it’s time to take some serious care. And by the way, how much protein should you consume? Pregnant and breastfeeding women need about 71 grams of protein per day. These are approximate figures. The actual requirement might differ (in case the individual has any specific condition). The recommended daily intake (RDI) is 56 grams for men, and 46 grams for women. Simply put, you need anywhere from 0.8 grams to 1.3 grams per kg of your body weight of protein every day. Replace cereal with eggs. Most breakfast foods, including cereals, are low in protein. But 3 eggs offer you 19 grams of high-quality protein. Go for Greek yogurt. Because it is a high-protein food. One serving of Greek yogurt gives you 20 grams of protein, which is double the amount offered by traditional yogurt. Have the protein first. This is because protein increases the production of a gut hormone called PYY that makes you feel full. This also discourages you from downing unwanted calories. Use almonds to top your food. Apart from magnesium and vitamin E, they are also high sources of protein. They add flavor and crunch to your meal. Take a protein shake for breakfast. Protein powders can do the job. Though smoothies contain lot of fruit, they may contain less protein. You can add one scoop of protein powder and enjoy the shake along with your nutritious breakfast. Have a high-protein food with every meal. 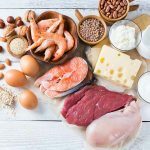 Include high protein food sources (you have seen some of them in this article) in every meal of yours. Peanut butter with fruit is a good combination. Fruit alone can sometimes be low in protein. But pairing it with peanut butter can pack a nutritious punch. That was all about top list of high protein foods, its recommended dosage and how to increase protein intake. Now it is time to take some expert secrets. Whey Protein: This could be mixed with water or unsweetened almond milk and drunk alone pre and post workout. Or, it can be blended into a smoothie with some fruit and nut butter as a great meal replacement. Whey protein is fast absorbing, great for pre and post workout and also helps to suppress appetite! Turkey Bacon: Nitrate-free, organic and free range. Rich in protein, it has a strong, yummy flavor and crunch. It can be chopped up and added to salads for an extra punch. Another favorite way to eat this is wrapped around grilled shrimp. Hemp: Hemp is considered to be one of nature’s most perfect foods. The protein found in hemp, along with fiber, helps slow digestion, so you don’t get a huge spike in your blood sugar. It will also keep you feeling full longer. Hemp protein is considered to be a complete protein which means it contains all the nine essential amino acids needed to meet our body’s needs. Quinoa: Like hemp, quinoa is also considered to be a complete protein. In just one cup of cooked quinoa, you can get more than 8 grams of protein! Quinoa also contains more protein than rice, millet, and wheat. Beans: In just more than one cup of beans, you can get about the same amount of protein as you would in a piece of chicken. Beans have what meat lacks – they contain phytochemicals, compounds only found in plants. They are high in antioxidants, a type of phytochemical, that prevent free radicals in the body. Eggs: They are easy to prepare, inexpensive, versatile; you can eat them as a snack or meal, make veggie omelets, hard boil an egg for a snack, throw hard boiled eggs in a green salad, and my favorite, egg salad. Tuna: Cheap and versatile. I mix a can of water-packed tuna with light mayo, diced celery, dill, red onion; keep in the refrigerator for a light snack or lunch. Sliced Turkey Breast: Easy and quick, no cooking needed. Great for a quick lunch or snack! Nuts: They are satisfying; contain healthy fats, great for snacks and in salads. Beans: Toss in salads, I love hummus as a sandwich spread and a veggie dip. The three protein-rich foods that I recommend to clients are all plant-based because current research shows that a whole food plant-based diet is the best protection against lifestyle diseases. Many plant foods also contain fiber, omega-3 fats, antioxidants, and other essential nutrients that animal protein foods lack and they don’t contain cholesterol or saturated fat. I suggest to my clients that they eat quinoa regularly, which is a great source of complete protein, plus fiber, iron, and magnesium. It is extremely versatile. Lentils are my second choice as they also contain all essential amino acids, important minerals, and fiber. Hemp seeds are my third favorite source of protein as they have a perfect ratio of omega-6 to omega-3 fats and are a highly bioavailable source of complete protein. Too much of protein can cause body fat. It can also cause damage to the kidneys. Which foods with high protein are good for pregnancy? Beans, lean meat, eggs, cheese, poultry, and yogurt. Other protein sources mentioned in this post would suffice too. Should women avoid soy protein? Women who are undergoing hormonal therapy or have breast cancer (estrogen-receptor-positive) must avoid soy protein and soy-based supplements as they contain isoflavones. Women with any other medical condition must consult their doctor once before taking soy protein. Can I take protein infrequently instead of daily? Doing so may not give you the amount of protein you require every day. So, it’s better to take adequate protein every day. Also, protein doesn’t get stored in the body. Hence, you need to replenish the reserves. Protein is important. And you just cannot ignore it. But unfortunately, most of us do. Of course, not many of us go about our days thinking if we are getting enough protein, do we? Include these top protein foods in your diet and welcome a healthier tomorrow. And tell us how this post on high protein foods has helped you. 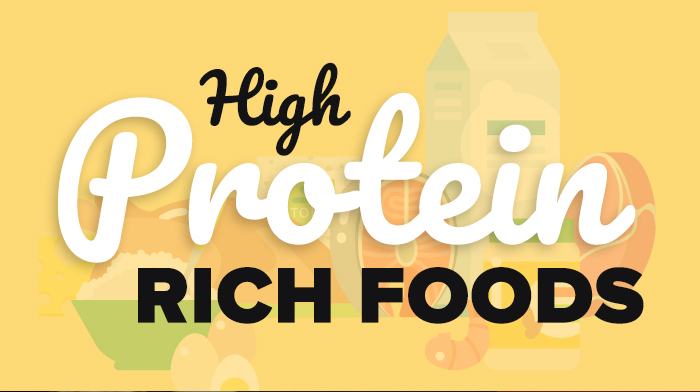 Do you have any additions to the above list of rich protein foods? Do comment in the box below.